UK Skills Minister John Hayes shares his thoughts on education with Peter Cheney. “Learning matters because it changes lives,” John Hayes remarks. His enthusiasm for education is clear throughout the conversation but he also warns that falling behind in skills will hold back the UK’s economic recovery. Visiting Northern Ireland for the first time, he has just addressed the Institute of Careers Guidance’s conference. 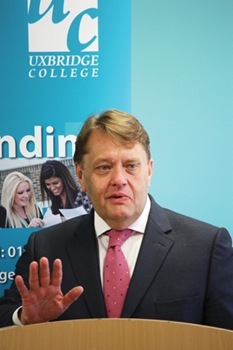 As education is devolved, Hayes’ remit covers England and also representing the UK in meetings with skills ministers from other national governments. Under the spending review, an extra £250 million has been allocated for apprenticeships in England; the 2010- 2011 budget for this work now stands at £557 million. However, in England, he has found their work has been held back by bureaucracy. “We need to set them free to innovate so they can excel,” Hayes adds. This sense of worth can be experienced at an individual, communal and national level. “We certainly wouldn’t want learning to be entirely utilitarian,” he comments, adding that practical learning can combine both “beauty and utility” even in software development and advanced engineering. John Hayes graduated with a BA in politics and a PGCE in history and English from Nottingham University, before going into business. While working as director of a software company, The Database Ltd, he also sat on Nottinghamshire County Council for 14 years. Hayes was elected MP for South Holland and The Deepings, in Lincolnshire, in 1997. As Minister for Further Education, Skills and Lifelong Learning, he works across the Departments for Business and Education. Married with two sons, his interests include painting, architecture, English literature and boxing.